Boasting free bikes and a garden, Villa 91 Guesthouse is situated in Bangkok. Attractively set in the Bang Khen district, the property is located 12 km from Central Plaza Ladprao and 13 km from Chatuchak Weekend Market. Both free WiFi and private parking are accessible at this property. All rooms include air conditioning, and some units at the guest house have a balcony. Guests at Villa 91 Guesthouse can enjoy a continental breakfast. Central Festival EastVille is 17 km from the accommodation. The nearest airport is Don Mueang International Airport, 12 km from the property. Please inform Villa 91 Guesthouse in advance of your expected arrival time. You can use the Special Requests box when booking, or contact the property directly with the contact details provided in your confirmation. This double room has a microwave, bathrobe and dining area. 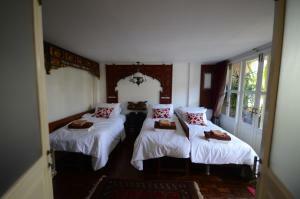 This double room features a bathrobe, dining area and tea/coffee maker.